Thanks to everyone who braved the cold weather to come out today to help Grace Evangelical Church and the Real Life Center conduct the monthly Mobile Food Pantry on the grounds of Grace Evangelical. Volunteers packed and distributed bags of grocery items provided by the Atlanta Food Bank. We helped serve 160 needy Fayette County families. Thanks to Karen Hughes, and those who donated, for collecting blankets in support of Fayette Samaritans. Karen collected approximately 60 blankets that will soon be distributed to needy families in the Fayette County area. Our church ladies collected diapers in support of the Pregnancy Resource Center as part of their annual Christmas dinner. Over 1,000 diapers were collected for this important ministry. Thanks to everyone who helped out this week to make our annual Toys-for-Tots event a success. In addition to partnering with our friends at Grace Evangelical Church, we also had the opportunity to partner Grandparents and Kin Raising Children, a ministry dedicated to assisting in the successful development of children being raised by grandparents or other relatives. We had a great time as usual at the wrapping party where we wrapped approximately 300 presents, and enjoyed an evening of food and fellowship at the Community Christmas Party where the gifts were distributed. Thanks to everyone who participated in gift collection for the client families at the Pregnancy Resource Center and Promise Place. We were blessed to help spread some Christmas cheer to a few needy families in the local area. Our Youth Group, one of our small groups, and one of our young married couples all “adopted” families. Thank you to everyone for your generosity. Thanks to everyone who braved the cold weather to come out today to help Grace Evangelical Church and the Real Life Center conduct the monthly Mobile Food Pantry on the grounds of Grace Evangelical. Volunteers packed and distributed bags of grocery items provided by the Atlanta Food Bank. We helped serve 210 needy Fayette County families. Pastor Frank and the millennial small group had a great time this week at the OCC processing center in Suwanee. They prepared a ton of boxes for shipment to kids all over the world, and even worked alongside a young man, who as a child was an actual recipient of an OCC shoebox for Christmas. We were blessed to partner with the Real Life Center to pay a single mother’s past due rent in order to prevent an eviction. Thank you to everyone who donated a Christmas shoebox. We collected 39 boxes that will be shipped to needy children worldwide. 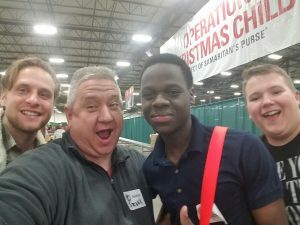 Operation Christmas Child is a ‘global Christmas gift exchange’ project operated by Samaritan’s Purse. 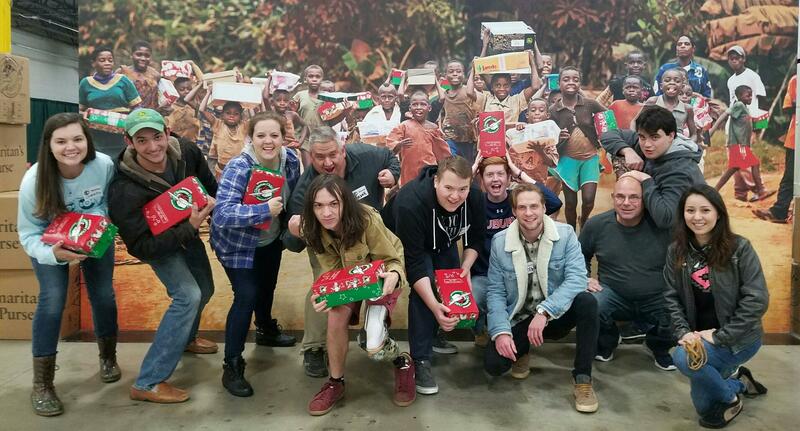 The mission of Operation Christmas Child is to demonstrate God’s love in a tangible way to needy children around the world by collecting and distributing shoeboxes filled with toys, school supplies, personal items, and other gifts as Christmas gifts to millions of children each year. Thanks to everyone who came out today to help Grace Evangelical Church and the Real Life Center conduct the monthly Mobile Food Pantry on the grounds of Grace Evangelical. Volunteers packed and distributed bags of grocery items provided by the Atlanta Food Bank. We helped serve 212 needy Fayette County families.